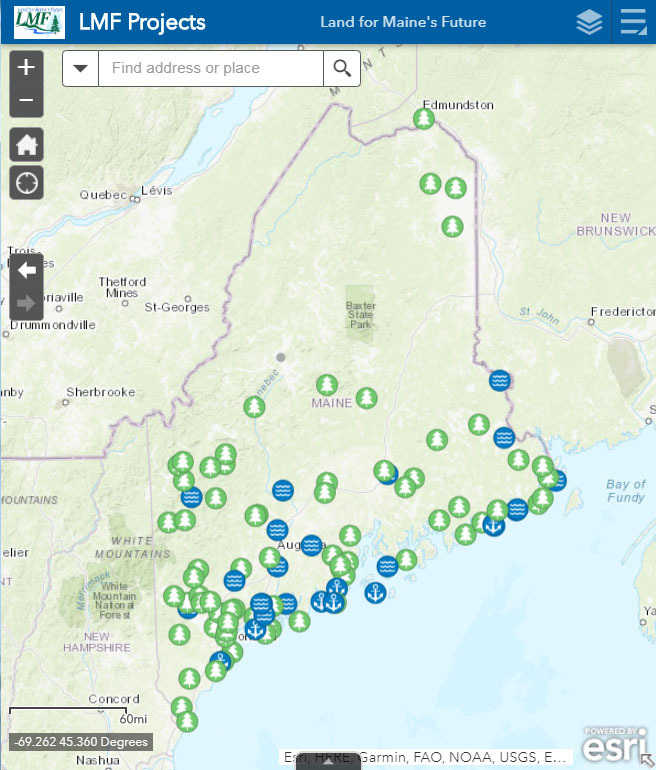 Over the past 30 years, the Land for Maine’s Future program has protected some of Maine’s favorite recreational and natural areas, and now you can easily locate many of these areas with LMF’s new, easy to use interactive map. "We wanted to showcase the fantastic sites Mainers and visitors can enjoy, areas where you can hike, bike, fish, hunt, canoe and kayak; areas where anyone can enjoy Maine’s great outdoors," said Sarah Demers, Director of the LMF program. "This map is a wonderful tool for anyone who enjoys being outside; it’s sortable, searchable, and available on your smartphone." Accessing the map is easy. Just visit the LMF Projects website to start planning your next outdoor adventure. Click on any of the marked sites to find information on the size and location of the property, available recreational activities, photos and more. You can also use search the map by activities, location or by name. The map also shows other conserved lands in the area. The site is not a complete list of the projects protected over the last 30 years. Working farms have been omitted as have some working waterfront sites. Future efforts may include reaching out to working farms protected with an LMF-funded easement to determine their interest in being added to the site. Additional projects will be added to the site as they become available. The new map is designed to inform people about the LMF program and its role in protecting Maine’s recreational and natural areas. The program was reviewed by the Legislature in 2015 as part of the Government Evaluation Act. This evaluation included a recommendation to improve public awareness and use of lands acquired with LMF funds. The Land for Maine's Future Program is the State of Maine's primary funding vehicle for conserving land for its natural and recreational value. The program was established in 1987 when Maine citizens voted to fund $35 million to purchase lands of statewide importance. Over the past 30 years, the Land for Maine's Future Program has assisted in the protection of 54 water access sites, 40 farms totaling more than 9,700 acres, 24 commercial working waterfront properties, more than 1,200 miles of shore lands, 58 miles of former railroad corridors for recreational trails and over 570,000 acres of conservation and recreation lands including 332,000 acres of working lands with permanent conservation easements. The Land for Maine’s Future Board is pleased to announce that they are seeking proposals for Working Waterfront Access Protection Program (WWAPP) projects. The Board will make awards up to approximately $2 million from Land for Maine’s Future bond funds. The Maine Working Waterfront Access Protection Program provides funds to protect and secure commercial fishing access in Maine. WWAPP requires future development of funded property retain its use for commercial fishing and closely related activities. Letter of intent due by January 4, 2019. Proposals due March 22, 2019. View the Working Waterfront Access Protection Program workbook and all information necessary to apply for LMF funds. The Land for Maine's Future Program is the State of Maine's primary funding vehicle for conserving land for its natural and recreational value. The program was established in 1987 when Maine citizens voted to fund $35 million to purchase lands of statewide importance. In 1997, new priorities were set forth by a commission of Maine citizens. Since that time the program has administered multiple bonds and even instances of general fund appropriations. Acquisitions include more than 1,200 miles of shore lands, and 158 miles of former railroad corridors for recreational trails. Over 570,000 acres of conservation and recreation lands. This includes 332,000 acres of working lands reflecting LMF's efforts to conserve the working landscape and keep lands in private ownership with permanent land conservation agreements. Funding: The Program works to coordinate and finance acquisition of lands. Through the use of matching funds, the program encourages partnerships with local, regional, statewide, and federal conservation organizations. 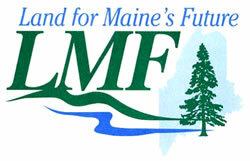 The LMF Program's priorities have evolved since 1987, however, the prime focus remains the same – conserving the prime physical features of the Maine landscape and recognizing that working lands and public access to these lands is critical to preserving Maine's quality of life. In 1999, the program was broadened to allow the use of funds for projects having local and regional significance as well as for projects having statewide significance. Maine citizens also authorized support for conservation lands held by local groups partnering with municipalities and private land trusts. In 2005, the Legislature added a working waterfront pilot program. The Legislature increased the requirement for matching funds to a 1:1 ration in 2010. Keys to success: The Land for Maine's Future has garnered broad based support because it respects landowner rights by acquiring land only from willing sellers, pursues a mission defined by the public, provides a tangible return to everyone who cherishes Maine's landscape (from hunters, to hikers, snowmobilers to bird watchers), and leverages both federal and private funding for state priority purchases. Proposal Process: The Land for Maine's Future Board issues calls for proposals on a periodic basis. Applicants are encouraged to work with program staff to complete the application process, which is described in the Land for Maine's Future Workbook.